I'm not recieving any mails anymore? Others form, from same account are still sending mails? 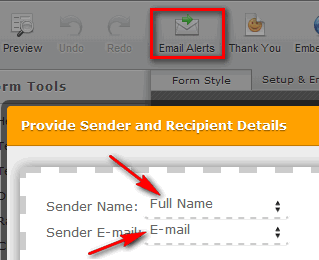 Can you please configure your email alerts' sender name and email to "JotForm" and "noreply@jotform.com", respectively. Just please let us know if you need any further assistance. Thank you so much! It's only the first form thats the problem, even if i want to send from "Submissions"
This form: http://www.jotformeu.com/?formID=3261347345 have no problem and is configured the same way? (is used here: http://www.hjv.dk/MHV/Info/Sider/forside.aspx) and the same provider used on both forms. Yes, this happens sometimes if a submission was not successfully delivered to your email. You can try to switch it back to the prefered settings first then if it will work then you can try to switch it back to your original settings and see if it will work again.